Paris : Editions Rivages, 1990. This paperback edition is the first translation of The Blessing Way into French. The cover is printed in full color (no credit). 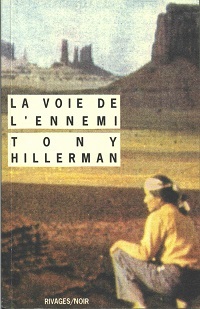 Tony Hillerman Abroad: "A translation by Daniele and Pierre Bondil of The Blessing Way which uses hillerman's original title, 'The Enemy Way.' The cover illustration is a tinted photograph of Monument Valley with a Navajo man kneeling the foreground (not credited)" (Hieb, 1993:). Format: Paperback, 16.5 x 10.5 cm.